It is recommended that several separated, low frequency radio transmitters with large parabolic reflectors transmit powerful radio transmissions into the methane rich zone over the Siberian shelf and cause the methane to decompose almost immediately. Methane can be decomposed by radio waves with a frequency of 13.56 MHZ which is equivalent to a wavelength of 22.10858835 metres. Experiments have shown that at low pressures, methane concentrations and methane flow rates the process of decomposition is enhanced (Lien – Te et al. 1998). The 13.56 MHZ radio frequency decomposes methane into nanocrystalline diamond and hydrogen (Mitura et al. 2006). The nanocrystalline diamonds may form a fine highly reflective fine cloud in the stratosphere and enhance the cooling induced by the breakdown of the methane. At lower altitudes the nanodiamonds may form a fine snow which could be harvested on land for use in abrasives. 13.56 MHZ are HF decameter waves, ITU Band No.7 (3 – 30 MHZ frequencies, 10 m – 100 m wavlengths; Lide and Frederickse, 1995). 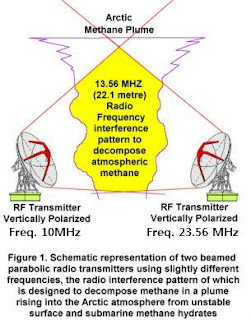 The main radio transmitters need to transmit low frequency carrier waves carrying a 13.56 MHZ signal to initiate decomposition of the methane in the atmosphere. The low frequency RF signals are LF kilometer waves (ITU Band No.5, 30 – 300 KHZ frequencies, 1 – 10 km wavelength; Lide and Frederickse, 1995). Low RF frequency (30 – 3000 KHZ) radio waves have the property of following the curvature of the Earth as surface waves by groundwave propagation (Wikipedia, 2011). These waves need to be vertically polarized to stop the conductive ground short circuiting the electric field (Wikipedia, 2011). 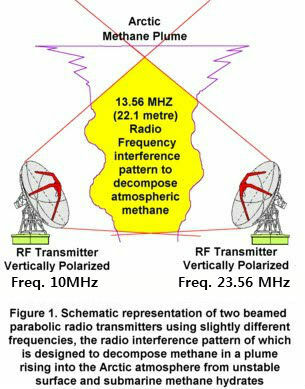 The transmitters need to be located in a line on opposite sides of the methane emission zone in Siberia (Light, 2011) and opposing transmitters should transmit with slightly different carrier frequencies so the the interference pattern set up between them in the methane cloud has a wavelength of exactly 22.10858835 metres. By also adjusting the phases of the two transmitter carrier waves and the superimposed 13.56 MHZ signal a large 13.56 MHZ amplitude should be attainable in the RF field which will then quickly decompose the methane it is passing through. For example the two opposing transmitters could transmit the carrier waves at wavelengths of 2000 metres (149.896229 KHZ) and 2022.10858835 metres (148.2573487 KHZ) and the interference pattern between the two of them will be the required methane decomposition wavelength of 22.10858835 metres. The HAARP transmitters in Alaska could be used to set up a 13.56 MHZ oscillation on the E layers above 70 km which should pulse back to the Earth and destroy methane en route. Another possibility is to set up a lower frequency standing wave between between the E layers and the Earth using HAARP and a 13.56 MHZ signal could then travel up and down the standing wave destroying the methane en route to the Earth and back. Lein-Te W., Wen-Jhy L., Chuh-Yung C., Moo-Been C., Huei – Chuau C, 1998. Converting Methane by using an RF Plasma Reactor. Plasma Chemistry and Plasma Processing, vol 18, No.2, pp. 215 – 239. Lide D. R. and Frederikse, H.P.R., 1995. Handbook of Chemistry and Physics. 75th Ed. CRC Press, London, pp. 1-1 to 1 -33. Mitura S., Mitura K., Niedzielski P., Louda R., Danilenko V., 2006. Nanocrystalline diamond, its synthesis, properties and applications. Journal of Achievments in Materials and Manufacturing Engineering. Vol 16, Issue 1-2, pp 9-16. Hope it works and is implemented. More R&D is needed to find out how much energy will be needed to generate waves that can loosen a carbon-hydrogen link in the sky. Apart from the strength of the waves, temperature is another factor, and temperatures could be raised by making several laser beams intersect at a location with high methane levels. Further R&D is needed to find out what works best.